Tough. Dependable. A trailblazer. These are just a few ways to describe the 2018 Jeep Wrangler. Discover for yourself all the unique features, powerful off-road performance, and safety systems when you schedule your test drive at Southern Chrysler Jeep Greenbrier. We serve drivers in Chesapeake, Suffolk, Portsmouth, Virginia Beach and Norfolk. Your road to adventure starts where the pavement ends. The 2018 Jeep Wrangler helps you get there with a 3.6L V6 24V VVT Engine, which outputs 285 horsepower and 295 lb-ft of torque. If that can't get you where you need to go, then let the 4x4 system do it. Don't forget to bring your favorite toys with you! Whether it's with the up to 2,000 lb. towing capacity or up to 944 lb. payload capacity; if you want to bring it with you, you can! The infotainment you love doesn't have to stay home while you adventure. It can come along too thanks to the 2018 Jeep Wrangler's suite of features like the UConnect® system. It keeps you connected with navigation, Bluetooth® Audio Streaming and Voice Command, SiriusXM® Satellite Radio compatibility and Apple Carplay™ and Android Auto™ capabilities. Take A Test Drive Today At Southern Chrysler Jeep! Adventure is calling. 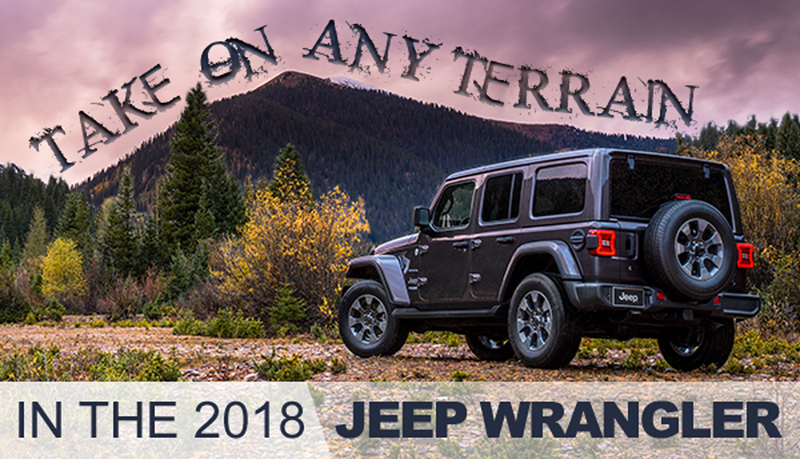 Answer the call in the 2018 Jeep Wrangler from Southern Chrysler Jeep Greenbrier. Serving drivers in Chesapeake, Suffolk, Portsmouth, Norfolk and Virginia Beach.